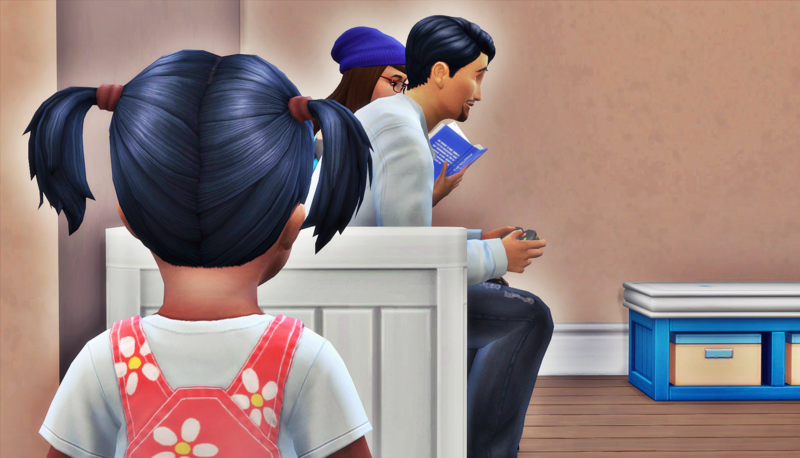 Gem and Asa returned home from school, and once again, they’d both had rough days. 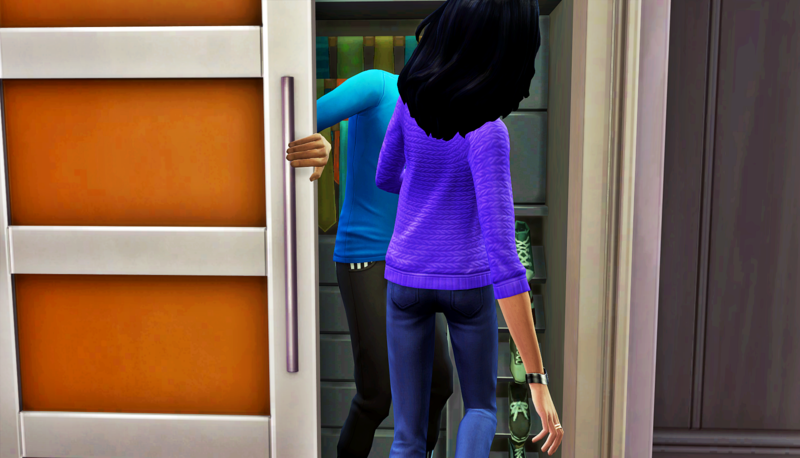 As they were leaving school, Asa convinced Gem to go straight home. He reasoned that if they went home first, they could improve their moods and actually get their homework done before having to take care of their sister. Gem agreed because both she and her father got recent promotions, so they could cover the cost of extended day care hours for one day. Asa had no intentions of doing his homework. But he had a great plan to improve his mood. As soon as they got home, he ditched his sister and called his girlfriend. 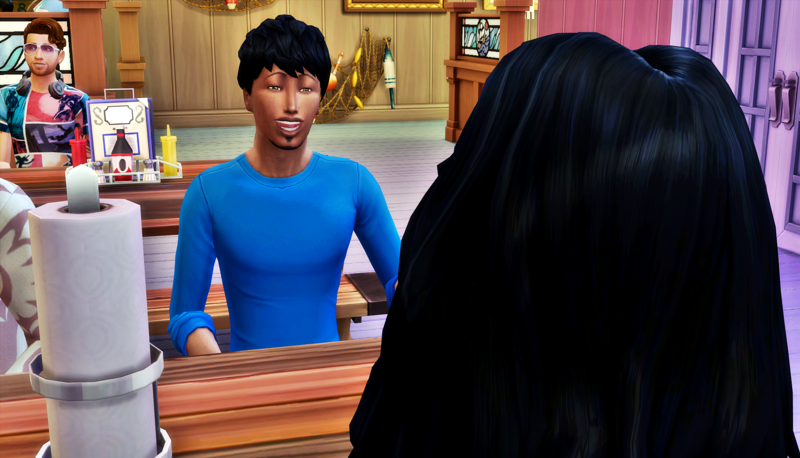 Olivia Spencer-Kim-Lewis agreed to meet him out. She was already on her way to the museum in Brindleton Bay. 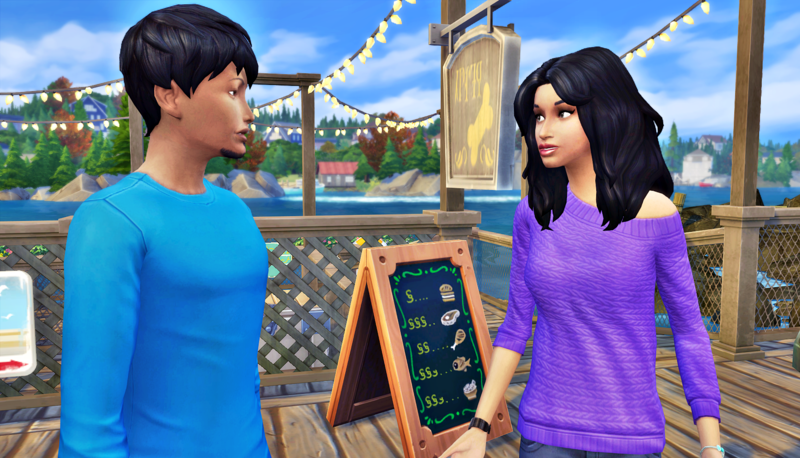 Asa didn’t want to go to a museum, so Olivia agreed to meet him at the Salty Paws Saloon. Olivia hoped Asa wanted to talk to her, and for a bit they did. He listened attentively to her exciting plans for after graduation. She planned to continue living with her parents just for a short while, then find her own place as soon as she started working and saved some money. She hinted that she wanted Asa to think about moving in with her. Asa hadn’t put a lot of thought into what he was going to do after high school. He didn’t hate the idea of living with Olivia. He liked her company, and if they lived together, that would make hooking up so much easier. He didn’t want to commit to the idea without giving it more thought though, so he gave her a non-committal response. Olivia, being Olivia, took the fact that he didn’t say no to mean the same as if he’d said yes. She was very excited and threw her arms around him in joy. “What should we do to celebrate?” Olivia would rather have had a fancy dinner at Chez Llama than a regular one at the saloon, and she was about to say so, but Asa had different ideas about what “celebrate” meant. “You know something, Asa Blank? Sometimes I think you only see me for one thing,” said Olivia. Asa considered his sister Gem his best friend. But if he really thought about it, Olivia was one of the only people who’s company he could tolerate these days. What harm would it do to change who he considered to be his best friend? “Okay, come with me to the kitchen,” said Asa. “Just come on,” said Asa. They spent the rest of the evening chatting and laughing. 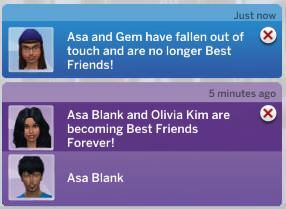 Asa seemed to finally get on board with the idea of making things more serious and official with Olivia after graduation. She finally headed home, claiming the need to do her homework. Asa stayed behind to finish watching the game that was on the TV. She felt secure in her relationship for the first time since they got together. She couldn’t wait to share this with her friend Robyn. 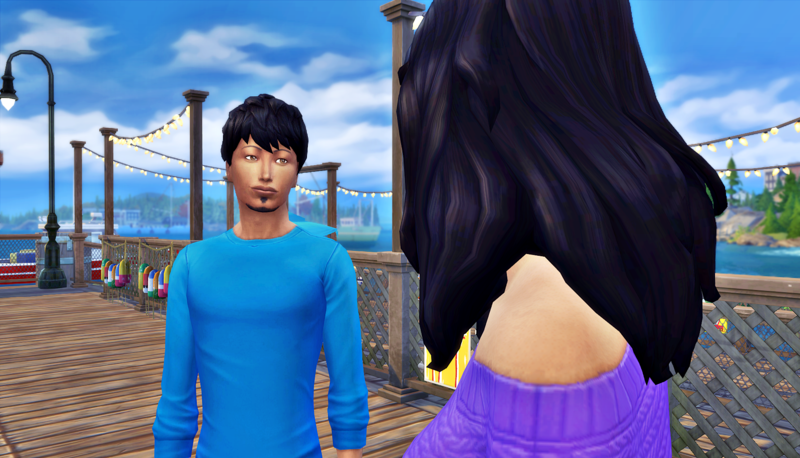 Back at the Blank house, Gem was working on her homework while Bo hung out with his club members. He’d figured out that he could excel at work while he connected with his friends. He was playing a racing game online with Carmen, Gavin, and Laurel. Sky had finished playing with her toys and wandered into the living room. She stood for a second and watched her family. Sky: My parents are the best! Ohhhh my…Of course Sky think’s Gem is her mother…When she grow’s up, this all gonna be quite some mess to explain to her. Such a mess. She understands that Heaven is her mother too, but it’s a basic understanding, kind of like how it makes sense to kids that they have a mother and a step-mother. From Sky’s view, Heaven is her birth mother, and Gem is basically her adoptive mother. Mmm hmm. Stay woke, Liv. As long as Heaven insists on not taking an active role in her family… I’m enjoying exploring what having no mother in the home looks like for this family. It’ll be interesting to see if growing up with two active parent figures will save Sky from ending up a hot mess. Oh most certainly! Well…maybe not lol. When she learns the drama with her real mother, maybe she won’t take it well. Or, maybe she won’t care cuz she knows who her *real* mother is. That last line was the sweetest thing ❤️❤️❤️ I love that Sky recognizes who the important people in her life really are! I don’t know the keys accepting maturity, so much is going along with his girlfriend’s ideas that don’t sound “too terrible.” He’s definitely more Sim-ified than the rest of his family. Gem a little bit. 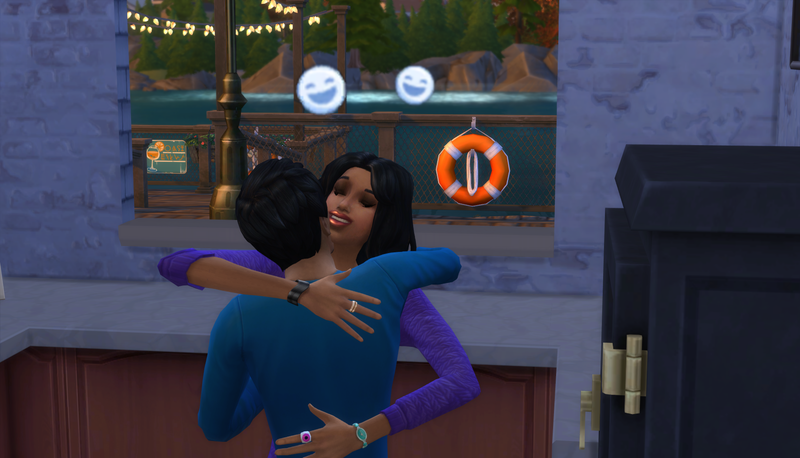 Heaven is moreso now that she lives with Sims. Bo is the only one who is still deeply Sixamian. It is heartbreaking. She knows Heaven, and knows she’s her mother, but thinks of Gem as her main mommy. As we’ve seen in blended and non-heterosexual families, kids can wrap their heads around the concept of two mommies. Unfortunately, Sky thinks of Heaven as her secondary mother. Gem ‘ s the only grown-up in the family , right ? Her and Asa are both teens. She works at the coffee house in the morning before school, Congress home and takes care of her sister until their father gets home from work, then cooks dinner and does her homework before bed. You know, typical teen stuff. I know she’s a teen. I was just noticing she’s the only grown-up , her mom included ! Oh! Now I understand you. Yeah… you are right. Her mother is selfish and basically anti-motherhood. 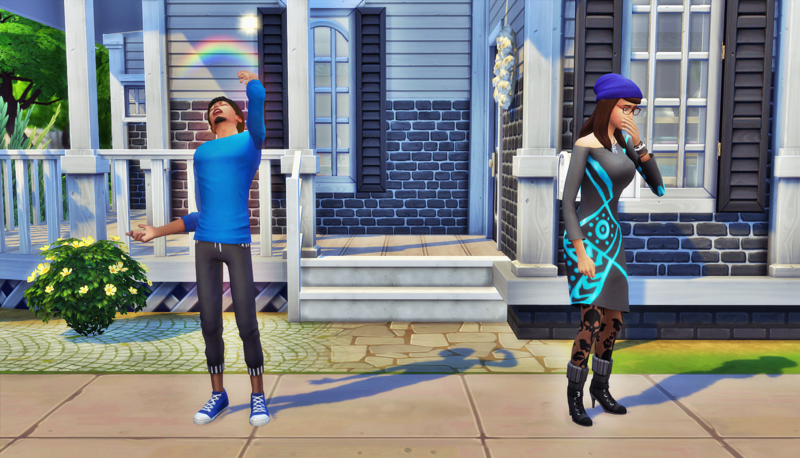 Her brother is selfish and basically doing everything he can to emulate a typical teen Sim. 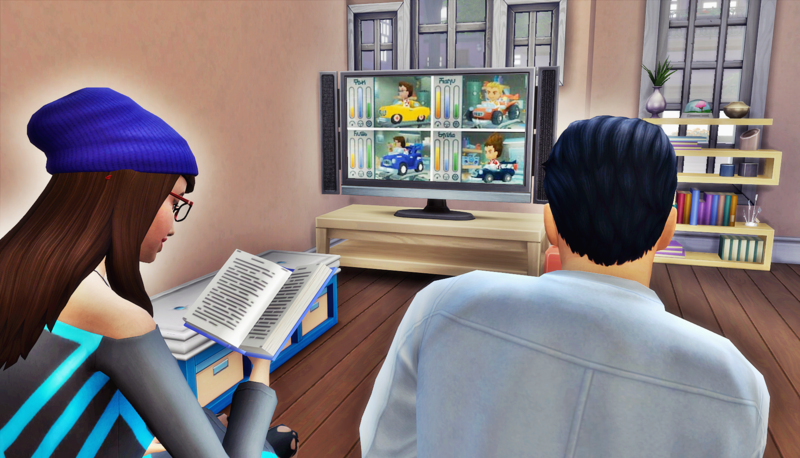 Her father is trying to be responsible and loving, but he feels ill equipped to raise a Sim. Add to that the fact that one of his traits is Childish. So when he’s playing with his daughter, he gets sidetracked from the educational fun because he’s more into the toys than she is!